Crown Cycles are proud to represent Frog Bikes who are a small British company dedicated to making cycling fun for children. Frog believe that the lighter the bike, the easier it is for children to learn to ride, and to enjoy it more as they progress. Many kids' bikes on the market weigh nearly as much as the child ! So Frog set about re-designing kids' bikes, creating a light but strong aluminium frame, and hand-picking components that offer a high performance without compromising the weight. The bikes are now also much easier to pedal due to a unique crank design from the renowned bicycle engineer Dimitris Katsanis (of Team GB Olympic fame). Only Frog applies this level of rigour to the design of kids' bikes. The starting point is to take the measurement of the child's inside leg. This is done using the method in the diagram opposite. 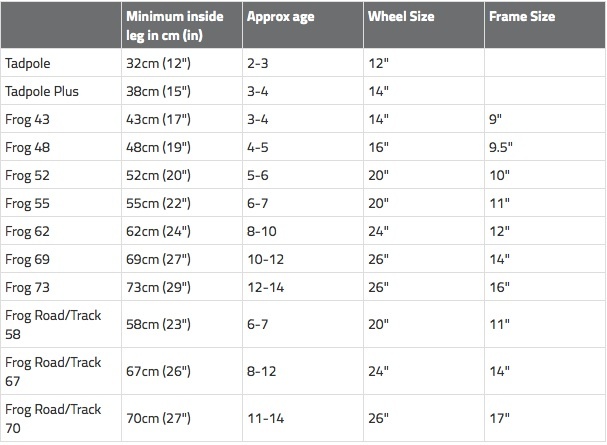 From there the bike size can be selected using the table below. Here at Crown Cycles, we carry a broad range of the popular colours in all of the sizes. Come visit us. We are passionate about getting the right size of bike for your child and are happy to advise you accordingly. You can sit your child on a bike and take it for a short test ride just to be certain of the correct fit. The current range of colour options and prices can be seen on the Frog Bikes Website.